Believe me, this recipe will surprise you. If you don’t tell anyone they’re eating beef heart, they would just think it’s the most tender and delicious beef, maybe mistaking it for tenderloin. Put washed parsley, cilantro, garlic, salt and lemon juice into a food processor and blend until all pieces are consistent and tiny. Add the first 250 ml of olive oil and pulse on low speed until thoroughly mixed. Transfer to a serving dish. Pour in more olive oil until it reaches just above the level of the greens. The parsley and cilantro should be completely submerged. Turn barbeque on high and allow it to heat up. 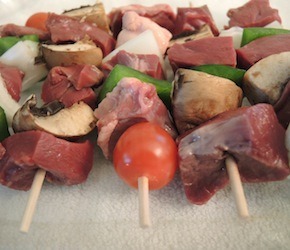 Skewer meat cubes and vegetables in alternating fashion. Leave a little space at the end where it can be gripped. Place finished skewers on a cookie sheet or tray and baste them thoroughly in olive oil. Sprinkle with salt and pepper. Once barbeque is hot (around 500ºF), place the skewers on the grill. Allow to brown for a couple of minutes and then flip over. You only want to cook the beef heart to medium-rare at most – any more cooked and it will get tough. It should only cook for about 5 minutes or so, but use your judgement, taking into consideration how hot your barbeque is. Remove from grill and place on a serving tray. Liberally drizzle on chimichurri and enjoy!